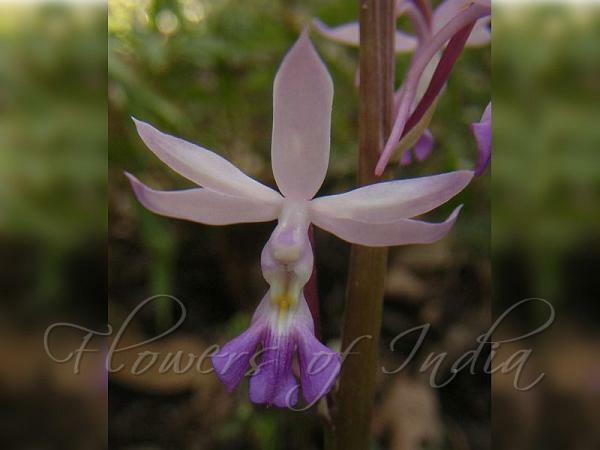 Plantain Calanthe is a terrestrial orchid with pale-pink, lilac or white, sweet-scented flowers. Flowers are many, borne on a stout stem longer than the leaves. Flowers are about 3 cm across, spuir long and very slender, horizontal. Lip is 3-lobed, lateral lobes broadly obovate, the mid-lobed boadly wedge-shaped, with three small orange ridges near the base. Sepals and petals are lanceshaped, pointed. Leaves are several, elliptic- lanceshaped, 20-30 cm, enlarging in fruit. 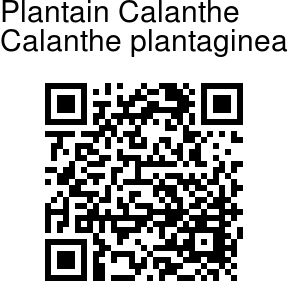 Plantain Calanthe is found in the Himalayas, from Pakistan to SW China, at altitudes of 1500-2100 m. Flowering: March-April. Photographed in Chamba, Himachal Pradesh.